LOOKING AT THE WAY THINGS HAVE BEEN DONE IN THE past only, has limited use for the future. We have worked on models of health for centuries that were right for their time, their technology and the knowledge of the health practitioners. But times have changed significantly. People are suffering from different illnesses now than they were even twenty years ago. The understanding we have as scientists and doctors of complex and obscure parts of the body are far beyond what we could have ever anticipated a short time ago. Rushika Fernandopulle is one of these visionaries that look at the world for the challenges he can surmount rather than fit in line with the way things are already happening. He co-founded Iora Health and they set out on foundation to challenge the way things were and provide a new way of delivering a sustainable and more effective primary care system. 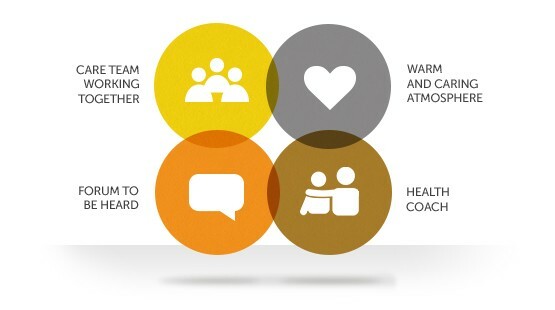 At first glance, these three goals might seem at cross purpose to each other. It is the firmly held belief of many governments, healthcare providers and large portions of the public that to provide better care you need to put more money into the care system. Cutting budgets (as it would be called in a political environment) is a healthcare no-no when it comes to political party manifestos and the way that our politicians court public favor when speaking to their electorate. Can you employ non-healthcare workers to provide or deliver majority of the primary care for clients on the phone or in person at their homes? Iora does this by employing health coaches with customer service background who manage relationships with clients on an ongoing basis, instead of looking at episodes of care and treating just symptoms. There was a patient who had issues with his health. He had hypertension and type 2 diabetes which went un-managed because of his lack of attention and not enough persuasion from the clinic team in charge of his care. This patient developed renal damage and needed to have dialysis several times every week to deal with this damage. To add to the physical health problems, this patient also suffered from anxieties and would walk out of the 3 to 4 hour dialysis sessions because he just couldn’t cope with what was going on in and around him. So, he would walk away from a scheduled session, return home to feel safe before crashing the next day and being treated with the same dialysis as an inpatient rather than an outpatient. This happened week after week and the patient ended up being admitted 37 times in one year at a cost of several hundred thousand dollars. You can see why this was ineffective for the patient, the medical team and the client base of the practice. That was until Iora team got involved. As part of their training and guidance they look for alternative solutions to any given situation. With the past giving quite a clear signal in this case of what was going on, the health coach took the time to get to know the patient. They felt this anxiety at home on occasions and in discussion revealed that they counteracted the feeling with music. They listened to music and it made him feel calm again. With that, the health coach bought an iPod and downloaded music onto it for the patient to use when having the dialysis. The result was that the patient no longer felt anxious at dialysis time, made every appointment, stayed through every appointment and was no longer admitted as an inpatient. A simple conversation, understanding of the patient’s needs and feelings provided a solution that was more effective than any drug that they were previously given as well as having no side effects and saving the healthcare provider hundreds of thousands of dollars. Patients often look for the magic bullet. They turn up at a doctor or physician and want to walk away with something physical in their hand that they can take to solve the problem. It is a natural thing to walk in to see a doctor and walk out with a tangible solution. ‘Take one of these three times a day with water after meals.’ It feels like progress is being made. But the solution is far more often something else. The patient in the example above shows that giving the patient a drug to deal with the anxiety wasn’t working. Maybe it was the patient who initially wanted to see the magic bullet that would solve the anxiety problem. But maybe it was the physician who prescribed it was just following the path of the norm. The normal solution with a patient presenting with symptoms of anxiety is to give them medication that will lessen the effect of the anxiety. Healthcare has got into this rut where we look at problems in terms of prescribed solutions. Every patient is different and feel their symptoms in a different way. The solutions need to be as different and wide ranging as the patients. This takes time initially, with an associated upfront cost, but saves huge amounts of time and money in the long run because, let’s face it, an iPod is a cheaper solution than inpatient emergency dialysis every week or so. So, how does Rushika Fernandopulle and Iora Health work? They have thrown away the rulebook that states certain symptoms require certain treatments. That doesn’t look at the whole problem and cannot be sustainable in the long term for medicine. Employers providers pay Iora Health to look after patients. They employ a team of healthcare coaches that sit down and actually listen to the patients and what the issues are. The idea is that Iora Health look at the patient in a way that will keep them out of hospital and the specialist office. The iPod example above is a great way of illustrating how this can be done. In the past, the relationship between an employer paying for healthcare and an employee looking to gain treatment have been at odds. The employee wants to try everything they can to get better. More consultations, different opinions and a chance to get better are all in their mind when they walk into a hospital or care provider. They just want to get better, without any consideration for the cost. The doctors end up spending a lot of time trying to persuade the employer that the care is needed and the patient will benefit. The employer wants a solution, but at the lowest cost possible. They don’t want their employee to go on experimental treatments or to see many doctors for slightly different opinions because there is a large cost involved with this. They want a quick solution that the doctor will find on the first visit. After all, they are paying for all of this. Iora Health takes a lot of the ‘adversarial’ element out of this situation by looking at the whole person and finding a solution that gets the employee better more quickly, at a lower cost and back to work for the employer. This is the solution that all parties are looking for, but the way that things have always been done means that it isn’t the solution that is most often arrived at. Think about it in terms of pure economics. The healthcare providers of old rely on patients coming back to them for treatment time after time. Iora Health look at this a different way. They charge more than a standard primary care provider to look after the patient for the employer. But they don’t look to have this patient keep doing the same things, costing the same or an increasing amount of money forever more. They look for a way to resolve the situation, or lessen the impact severely so that they can get back on with their life — and the employer that is paying for the treatment gets a happy and healthy employee back on their books as soon as possible. The future isn’t one of prescribing drugs or treatment and following the path that has already been furrowed by others. It is one of managing an illness or condition so it doesn’t affect the daily life of the patient as it had before. Rushika says the old model does not work at all. The medical industry is full of people who work hard for a living and have the interests of their patients at heart. There is no question about the dedication of the people who work with patients. But the model that they are out into restricts their decisions to a simple choice of treat or not treat. And this decision has to happen fast. There are targets to meet, more patients to see and shareholders to appease. Each medical practice has target times, appointment times and a long queue of people waiting to see the doctor. The pressure on time is immense. The waiting rooms of doctors and hospitals are filled with people who want their magic bullet — and often the patients have busy lives and tight schedules to keep. The solutions that Rushika Fernandopulle and Iora Health deliver works better for everyone. The medical community get to do what they felt like they were being trained for. They get to deliver healthcare that manages the problems of their patients and allows them to get on with their life. The patients get a better standard of care. They see the future where their condition or illness has gone or is effectively managed, often by lifestyle changes rather than prescriptions drugs with side effects. They get to feel a little bit better every day and know that they are being listened to. The people paying for the treatment, in this case employers, get an effective solution that may feel more expensive on day one but is clearly a much more cost-effective way of managing health in the long term. They get employees that know they are being looked after and are more productive in the workplace. In a model where everyone wins, why would we ever look back to an old model that no longer delivers the results that were promised? Changes the rules of the game. The change won’t happen overnight, but the more we hear of innovative providers like Iora Health, the more likely this solution will become the norm rather than viewed as something alternative. The effective way that patients are treated doesn’t come from looking at targets and crunching more people through the system in an ever-decreasing amount of time. This just isn’t the medicine that you and I know. The long-term answer is to look at the lifestyle of people and make those simple changes early that will keep them out of high-cost care in the years to come. The industry has a lot of work to do in this area. At the moment, it feels addicted to the way it currently works. It is an addiction that it needs to be weaned off. If you liked this post, you might be interested in my other posts: The Healthcare Gamechangers, Hospitals, a historical perspective and relevance for the future, You are not the Unicorn, You are Awesome, Shoot me if I ever say these things to a startup team, The Doctor is NOT in, the Doctor will see you NOW, and Davos Learnings for my Daugther. Ashwin Naik is an entrepreneur with interest in affordable healthcare, social enterprise and healthcare technology. You can also visit his blog to read more. Ashwin has been recognized as a Economic Times Leaders under 40, Young Global Leader By World Economic Forum, Young Leader by Asia Society, Senior Ashoka Fellow & as a Ted Fellow. Originally published at Ashwin Naik.